Yong Wang, Voiland Distinguished Professor in the Gene and Linda Voiland School of Chemical Engineering and Bioengineering, has been named a fellow of the Royal Society of Chemistry (RSC). According to the RSC website, those who are named fellows are recognized for making outstanding contributions in the advancement or application of chemical science or to the chemical science profession. The Royal Society of Chemistry is the largest chemical sciences organization in Europe, with more than 47,000 members. With WSU since 2009, Wang, who holds a joint position at Pacific Northwest National Laboratories, is an internationally known researcher in energy and renewable fuels whose work has had a significant impact on improving energy efficiency in the chemical and fuels industries. A WSU alumnus (MS, ‘92, PhD. ‘93, Chem E.), Wang’s work spans fundamental to applied research in catalysis and reaction engineering to improve the conversion of biomass and hydrocarbons to fuels and chemicals. Improving the efficiency of catalysts, which are used in many industries to chemically transform and create products and fuel, is important to increasing supplies, reducing costs and improving environmental impacts of petroleum-based and alternative fuels. 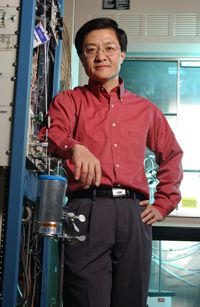 Wang is a Fellow of the American Association for the Advancement of Science (AAAS) and the American Chemical Society (ACS). The Chinese Institute of Engineers named him the 2006 Asian American Engineer of the Year. He is the recipient of three prestigious R&D 100 awards (1997, 1999 and 2008), which annually recognize the 100 most significant and innovative new technologies that have been introduced in the marketplace. He is also a recipient of the Presidential Green Chemistry Award and twice was named Pacific Northwest National Laboratories Inventor of the Year. He has more than 150 peer-reviewed publications, more than 100 invited presentations, more than 85 issued US patents, and six edited books and topic journals issued on novel materials and reaction engineering for fossil and biomass conversions.